Renew Your FPRA Membership Today! 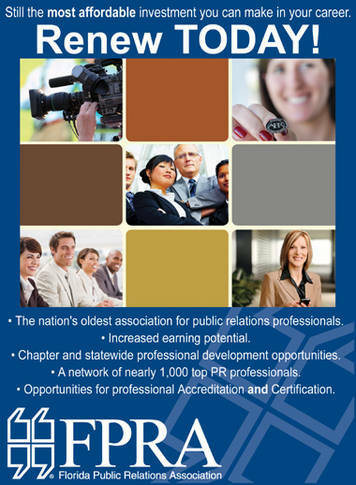 We are currently in the renewal period for the 2013-14 year for the Florida Public Relations Association. You should have received your renewal letter and membership form from the State Office by now. If you have not received your renewal form, please contact me at 321-917-7552 and I will let the State Office know so they can resend it to you. When my renewal form arrived, I made it a priority to renew right away so that I wouldn’t forget to do it. I’d like to encourage you to do the same. With our busy, hectic lives at the office and at home, things like this often get lost in the shuffle. Please take the time now to renew your membership with the Florida Public Relations Association, the oldest PR organization in the country.